In January 2016, Stacy Hopkins entered into her own personal fairy tale. 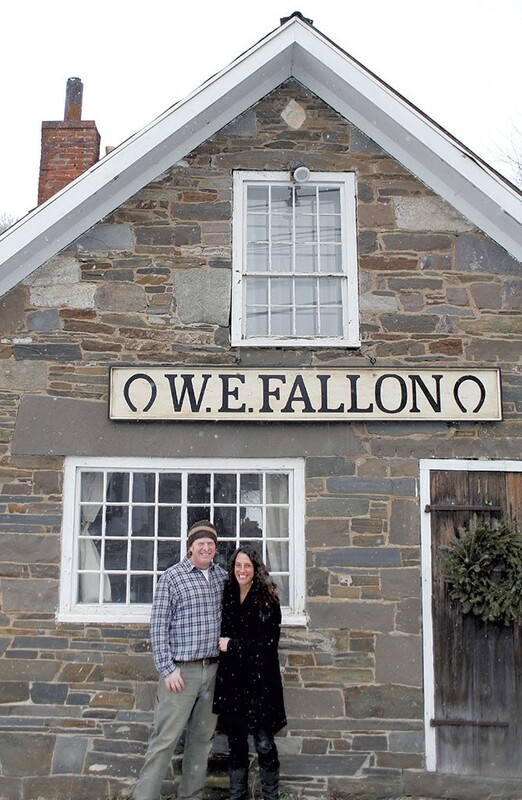 The jewelry designer — owner of White River Junction's Scavenger Gallery — and her boyfriend, carpenter Mark Meyerrose, closed on a historic Hartland half-acre property. It includes a centuries-old barn and a blacksmith shop dating back to the 1750s. 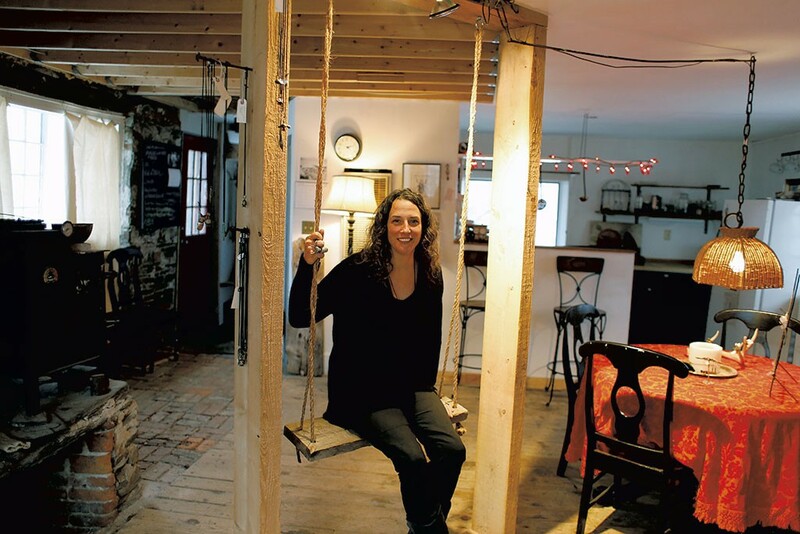 Though Hopkins has transformed the stone-walled workshop into her jewelry studio, the space retains what she called a "storybook," "out-of-time" feel. The blacksmith shop was built in "that era when things were really done to last," Hopkins said — and, indeed, it maintains many of its original features. Albeit somewhat crumbling, the stone forge occupies the north side of a small building; directly across the room is the outline of a barn door, which opened up for horses that needed reshoeing. It has since been replaced by an ordinary door, upon which Hopkins has tacked turkey feathers. Just below a western-facing window are wooden fixtures from the original work bench, holes for holding tools that are smooth with wear. Nearby are some of Hopkins' finished cast-silver pieces: a cuff with grasping crab claws, a pair of shell earrings, tiny acorn charms. "I'm really nostalgic for when people put thought and care into things," Hopkins said during Nest's recent visit to the shop. She was wearing one of her own pieces, a bronze casting made from a cat skull in the collection of La Specola, Europe's oldest natural history museum and public Wunderkammer ("cabinet of curiosities"). From majoring in biology to studying jewelry making in Florence, Italy, Hopkins has built her career on alchemizing the natural world with the very human process of making. Jewelry could easily seem out of place in a historic space made for heavy metalwork. But Hopkins' collections here are a variation on the theme of timelessness. Just like the building, her pieces are built to last. "There's no reason to have this disposable culture," she commented. Hopkins sells her line, along with fine wines and works by other local artists, at the Hotel Coolidge-adjacent Scavenger Gallery, which she founded in 2011. Beyond Vermont, she has found particular success in European markets and has been featured in Vogue Gioiello (Jewelry), Vogue, Elle Italia and Amusingold, among others. The studio, though lovely already, is still a work in progress, Hopkins noted. Currently, she and Meyerrose are considering knocking out its small second floor in order to raise the ceiling. When they bought the place, an awkwardly positioned built-in bookshelf created an obstacle — so they replaced it with a wooden swing. They're thinking about renting the space out through Airbnb in the future. Hopkins officially celebrated her studio's grand opening last August by hosting an evening party. Since then, she has continued to invite the public to intimate open-studio events; she believes that the history of the building "belongs in the community somehow," she said. "People from the community need to see it." To that end, it doesn't hurt that local favorite watering hole Skunk Hollow Tavern — also built in the 18th century — is directly across the street. "The only place I'd want to live in Hartland is across from the Skunk," said Hopkins with a laugh. She and Meyerrose reside in the converted barn, located between the studio and Lull Brook. Standing on the studio's simple wraparound porch, one can admire the house's high arched windows, which were salvaged from a nearby church and installed on the second floor. Inside, the house is open and airy, with exposed beams, white walls and plenty of natural sunlight. The couple redid the floors and installed a concrete kitchen counter. 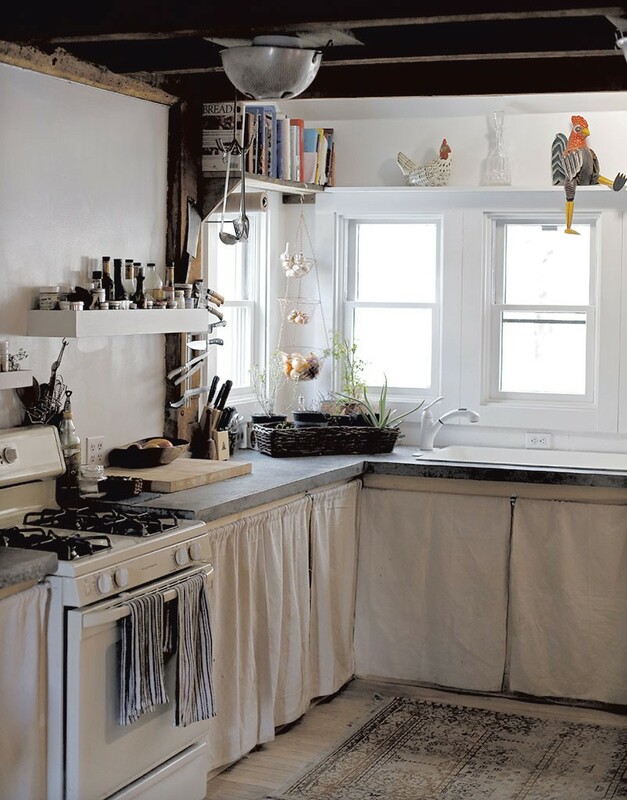 A large metal colander affixed to the ceiling light makes for an idiosyncratic touch. Hopkins pointed out handmade wooden pegs as well as the surrounding pencil marks, clearly relishing these details of authenticity. 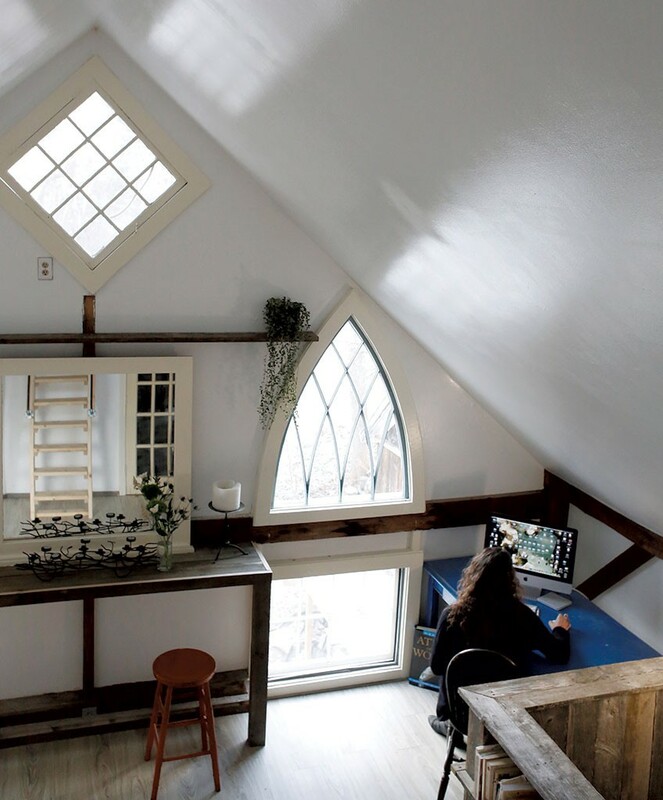 She continues to scheme and dream about uses for her newfound home and workspace. An oenophile, Hopkins foresees wine dinners and is also considering inviting artists to show work in the studio. "I want a place where I can finally use all of my ideas," she said. It would seem that her dream is coming true. The original print version of this article was headlined "Once Upon a Barn"